Portable- Fits 2X2 mounted slides and 35mm film strips and negatives. Bring your memories back to life with just a smartphone! 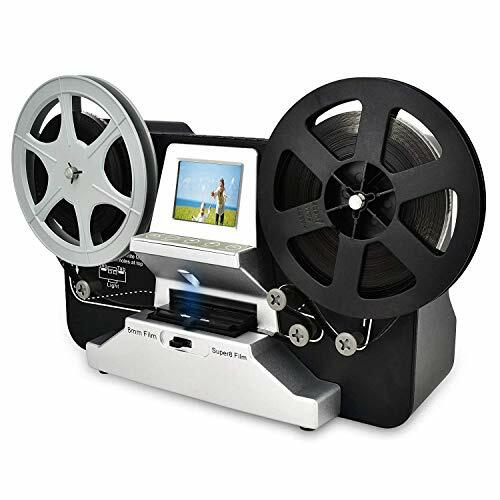 Love looking at your old films, but tired of messy wires and bulky scanning equipment? 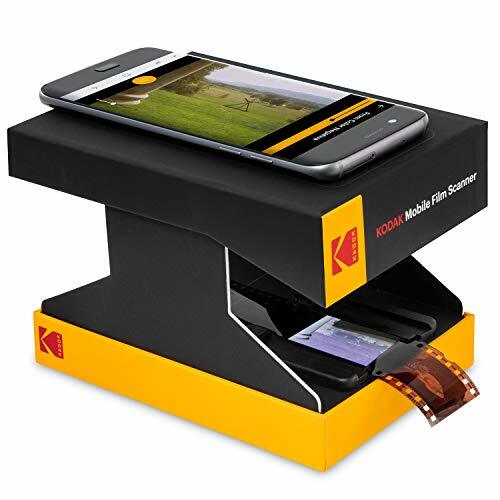 Skip the expensive fees and keep things simple with the KODAK Mobile Film Scanner. On the surface, it looks like a cute little box. But put it together, place your smartphone on top, and old photographs become digitized in seconds! Our handy scanner is crafted of heavyweight cardboard, which folds down into a small, compact package for portable ease. 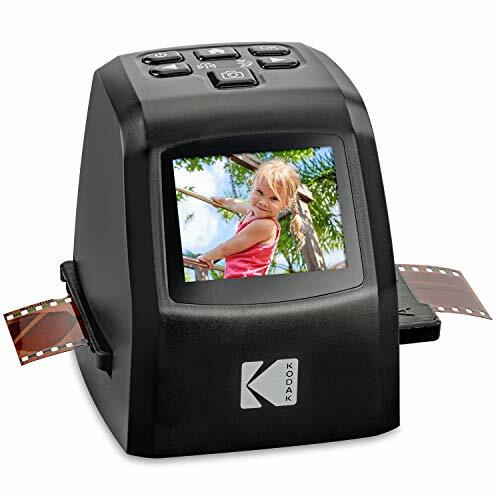 A built-in LED backlight illuminates your old 35mm films and slides, while the dedicated KODAK Mobile Film Scanner app lets you control everything on your smartphone screen. Crop, rotate and adjust images, add flattering filters, and share directly to social media for Throwback Thursday and more! It's time to get moving on your personal media conversion. 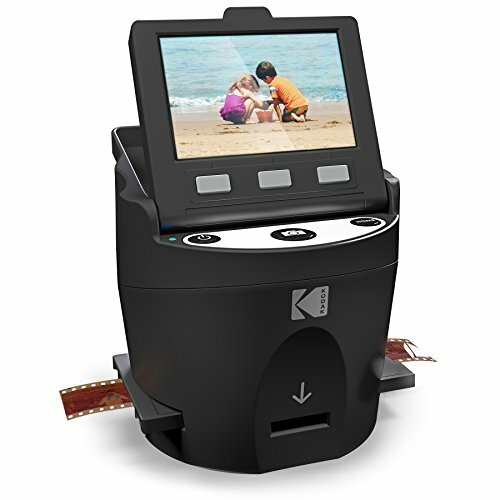 Choose the easiest, most affordable way to scan and save: Bring home a KODAK Mobile Film Scanner today. Let your editing skills unfold! The KODAK Mobile Film Scanner app for Android lets you restore old photos to their former glory with a full suite of editing features. Crop, rotate and adjust images, alter color and contrast, add flattering filters, and switch your camera from negative to positive mode with just a swipe. The simple interface makes it easy to download pics to your smartphone and share directly to your favorite social media sites. Finished your trip down memory lane? When you're done, collapse the smartphone seat and film tray into a cute, compact box, slip in your pocket and be on your way. Converting old photos has never been so smart, fun and affordable! OLD MEMORIES COME TO LIFE - Cool Tabletop Film Scanner Lets You Convert Old Film Negatives & Slide Positives With Your Smartphone; Just Scan & Save to Share! FREE COMPANION APP - Use the Android App to Capture, Crop, Rotate & Edit Images; Add Borders & Filters; Adjust Color & Contrast; & Share on Social Media! Fully Automated Digitizer to Convert Old 8mm and Super 8 Movie Reels Into Digital Videos. Support up to 9" reels and 1080P Your old reel-to-reel 8mm and Super 8 films are degrading. Worse, the memories are fading and the film is becoming more brittle just sitting in the box. Convert your Film into digital now before the memories are lost forever! Introducing the Wolverine Reels2Digital Moviemaker-Pro. A very simple to use device that will convert your movie reels into digital movies (no sound) with few strokes. 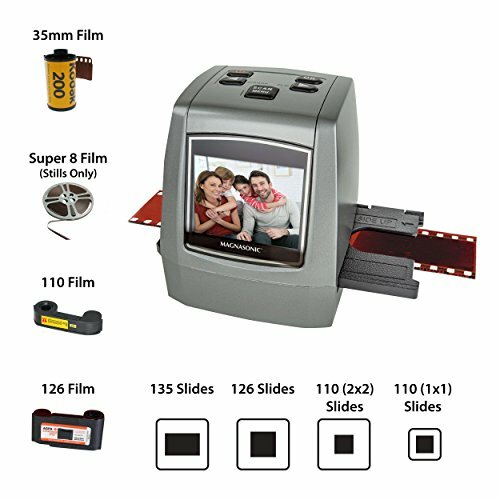 Works like a typical projector where you mount up to 9 inch reel, insert a memory card, press few buttons and the apparatus will pull the film and scan frame-by-frame to create a digital MP4 movie file that you can play on any computer, you can edit, upload to the internet or burn to DVD's. 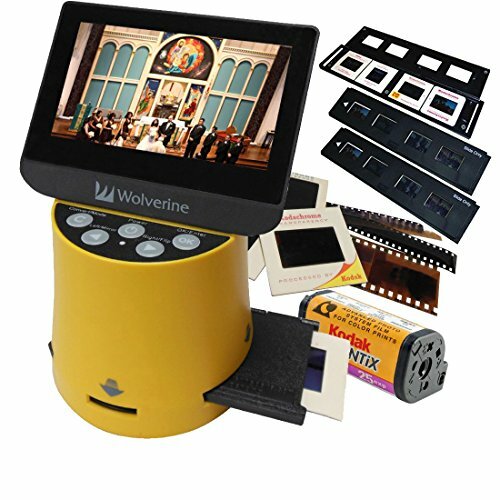 The Wolverine Reels2Digital Moviemaker-Pro pays for itself taking into consideration that photo Labs are charging more than a dollar to digitize a single foot of film! 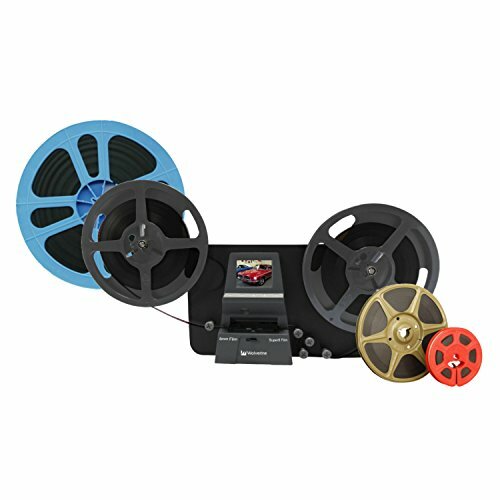 A fully automated apparatus to digitize 8 and Super 8 movie Reels (no sound and no split 16mm). Frame-by-Frame digitizing for high-quality digital conversion. Converts 8 and Super 8 movies into 1080P mjpeg-4 (MP4) digital video files. Compatible with all windows, Mac and Linux operating systems. Playback direct to tv's using the included TV cable. Built-in LED Light Box - Behind the generous glass viewing area are 4 Natural White 6000K bright daylight LED bulbs, which gently illuminate images for maximum clarity and contrast. It's perfect for viewing pictures anytime, anywhere. Make it Magnified - The trouble with old slides is that they are so small! Instead of squinting, users view the projected images with 3X magnification thanks an integrated lens. Photos appear bigger without losing sharpness or detail. Load-and-Look Ease - No more fumbling with multiple adapters or numerous machines for each film. 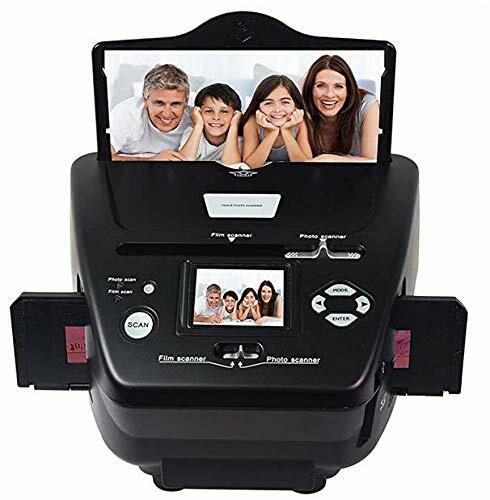 View old vacation photos, family portraits or birthday snaps in an instant by loading them one by one via slide slot or film feeder. 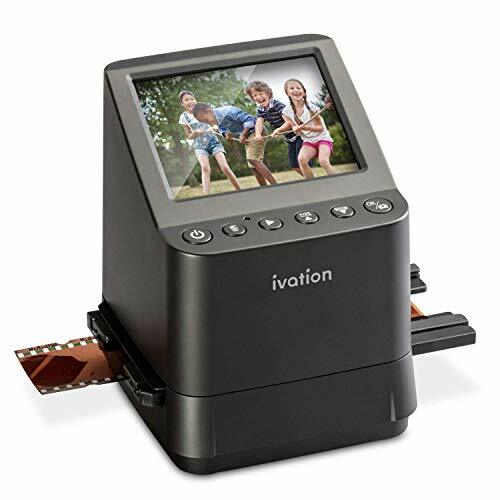 Light & Compact - The unit is lightweight for carrying and compactly designed for storage, measuring just 6".5 x 6" x 3"
JUST POP IN THE SLIDE TO SEE - Dedicated Slide Slot & Film Input Allow You to Load & Look in an Instant; Quick-Eject Button Removes Slide So You're On to the Next! Features: Have any old 35mm films or slides? Here's the perfect device to help you easily organize and externalize them. At the touch of a button, the image digitizer will scan and convert your old memories into sharp, vibrant digital images in JPEG format. These can then be viewed on your computer or other device, or printed out as regular photos. There is no need for a computer connection to operate the scanner. Once scanning is complete, the built-in 2.4-inch color LCD screen will display your digitized image. NOTE:1.This film scanner must be need a SD card. 2.buyers need to scan the picture into sd card then connected to computer under usb format, please choose the usb format on the film scanner screen when the film scanner is connected to the computer, after that , the computer can recogise the sd card and the picture will be showed sucessfully on the computer.At this time the computer is only for the power source. Have any old 35mm films or slides? Here's the perfect device to help you easily organize and externalize them. 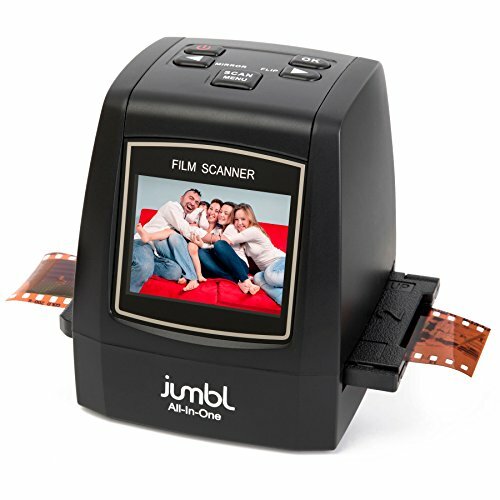 This Jumbl scanner sports a powerful 14-megapixel sensor that reads every detail contained in your films and slides. You can choose between the standard 14-megapixel scan, or enable the built-in software interpolation, which applies some image magic and ups the quality to an astonishing 22 megapixels. At the touch of a button, the Jumbl image digitizer will scan and convert your old memories into sharp, vibrant digital images in JPEG format. These can then be viewed on your computer or other device, or printed out as regular photos. With our film and slide scanner, all you need to convert your images are included in the box. There is no need for a computer connection to operate the Jumbl scanner. It scans, and converts images on its own, making it a very portable, accessible solution for digitizing films and slides. Scanning is also very easy and straightforward. Simply load the film or slide onto the negatives or positives holder, respectively. Follow the included instructions to slide the holder into place, and press the "Scan" button when ready. Snap! Your image has been converted and saved to the internal memory or an optional SD card. 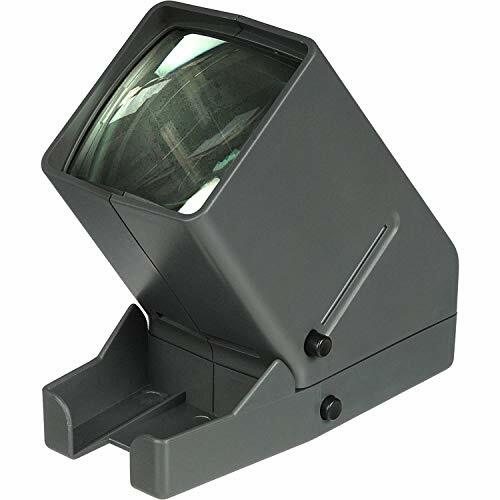 Once scanning is complete, the built-in 2.4-inch color LCD screen will display your digitized image. A clever piece of software allows you to flip the scanned image around by pressing a few buttons. This helps compensate for user error during scanning, and also adds some flexibility with image conversion. In addition, you can also adjust scanning resolution, brightness and coloration in the easy-to-navigate Capture menu. Converts 35mm/135, 110, 126KPK and Super 8 films,Slides & Negatives into digital JPEG format within 2 seconds. 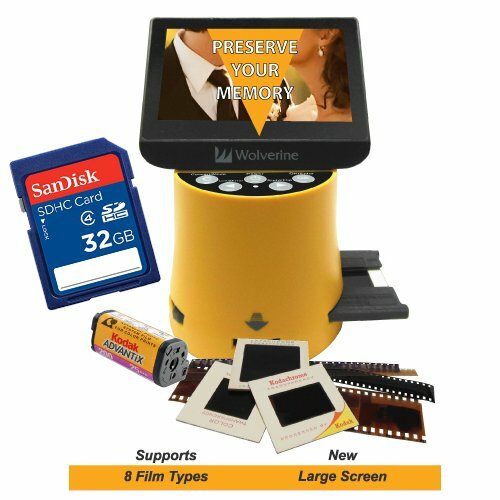 Stand-Alone and no computer required, tranfers your old film/slides to Color or Black&White picture in SD card(up to 32GB, not included) and supports to adjust the brightness or color of image. With software interpolation, digitized photo quality up to 22 Megapixels. Mac & PC Compatible, transfers high resolution images to your computer, laptop, smartphone and tablet. View the scanned photos directly on integrated 2.4 color LCD screen, or connect it to TV for larger screen display. Easy to operate for elderly. The main scanning device arrives with an arsenal of interchangeable adapters compatible with yesterday's most popular film and slide formats. Specific accessories include negative and slide adapters, 110 negative film and slide trays, and a Super 8 slide tray. No more sophisticated computer programs or specialty machinery. Once your chosen adapter is installed, smart technology converts each slide or negative into a JPEG file that you can save via internal or external memory. Just keep loading for fast, continuous photo scanning. You can view and edit photos right on the scanner, so there's no need for secondary software. Once the image appears on the screen, use the flip and reverse functions to change orientation; you can also adjust brightness and RGB values for perfect coloration. Finally, certain films allow you to enhance resolution from 14 to 22 megapixels. 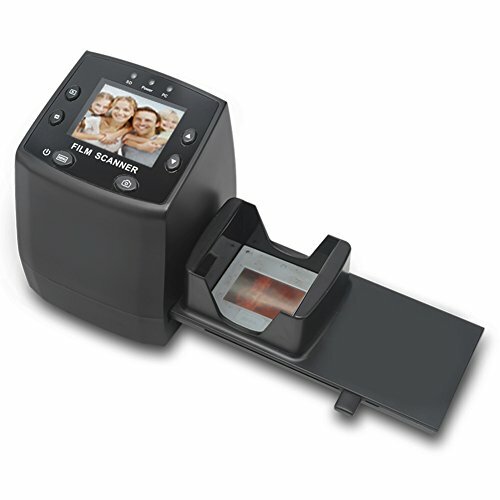 *Due to interpolation, the scanner automatically upgrades and enhances themegapixels of scanned photos from 14 - 22MP. Results not the same for all film types. 3-IN-1 INTERNATIONAL ADAPTER & MORE - Extended Accessories Pack Includes Universal Power Source for US, EU & UK, Cleaning Wand, USB Cable & TV Cable Power Adapter; Send & View Images on Mac/PC Computers, Big Screen TV, Etc. New 4.3" LCD screen, HDMI output and adding aps film. Now you can take all those stacks of 35mm (photo film & archive), 127, 126, 110, aps slides & negatives, regular 8mm and super 8 movies and convert them into digital JPEG images to share and preserve them forever. Wolverine has created a very simple to use device to convert all your film into 20 megapixels digital images in seconds. So simple to use, it only requires a push of a button. No computer or software is needed. Use it right out of the box to convert all your film by plugging it into an AC outlet or any USB port. All images are saved into its internal memory or direct to an optional SD/SDHC memory card. Easily connects to any Windows PC or Mac, to offload images or view on TV (TV cable not included). Boasting 128MB of built-in memory, easily store up to 100 photos until you're ready to share with friends and family. 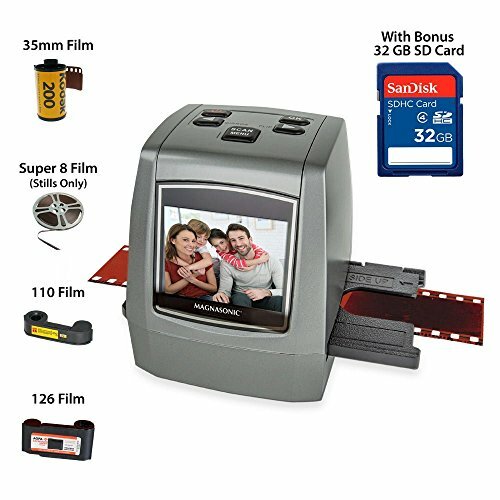 Use the included 32GB SD card to collect even more photos directly onto the scanner until you're ready to transfer elsewhere. Save time and effort with the included fast-loading film trays, Super quick 5 second scanning lets you get through that pile of film, negatives, and slides in no time at all. 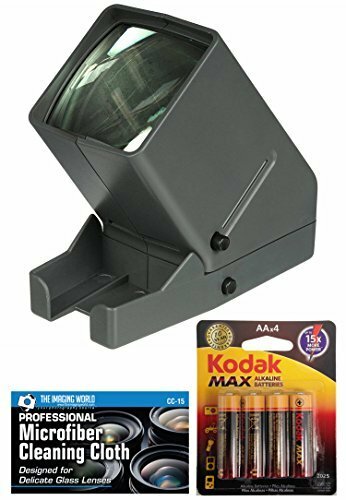 Effortlessly convert your 126KPK, 135, 110, Super 8 and Negatives into premium high resolution 22MP digital photo JPEG files. Still images only, not video. Relive and share your memories in no time with only the push of a button. Thanks to the generous 128MB of built-in memory, save up to 100 images directly onto the All-in-One Converter. The easy to use SD card slot expansion allows you to hold even more of your high resolution images until you are ready to transfer them to your computer, smartphone, tablet or digital picture frame. Bonus 32GB SD card included. With the Film2USB Converter, you can convert your slides & negatives to digital pictures in just 3 easy steps. It's easy -- just load your slides or negatives into the scanner, using the included negative holder or slide holder. Then, plug your converter with the included power adapter. Now, you can start scanning your slides & negatives! Each photo takes just seconds to convert, and you don't need a computer to scan! Your photos are saved in digital JPG format on the INCLUDED 2 GB SD card. After you're done scanning, you can either transfer your photos to your PC or Mac, or you can use the included video cable to view your photos on your TV! The converter comes with easy, step-by-step instructions, written in proper English. If you need help, you won't be left in the dark, where many other companies leave you. You'll get exclusive access to our top-quality customer support and will hear back from us within 24-48 hours. The converter comes with a 1-year warranty. Save Photos Directly on SD Card - No PC or Mac Required To Scan! SanDisk Secure Digital High Capacity (SDHC) Memory Card features an impressive 32 GB capacity to hold all your important pictures, videos, music, data files and more. 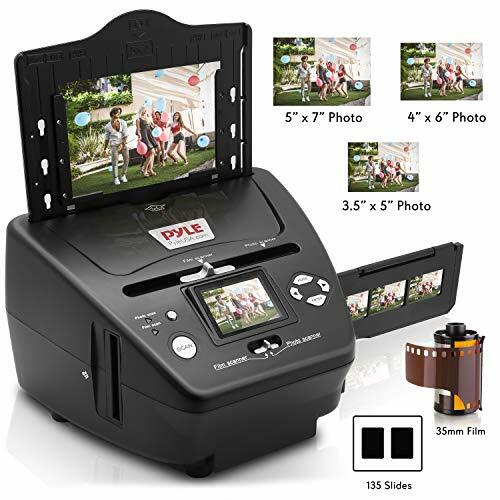 3-in-1 Photo, Slide and Film Scanner - Digital Media Converter Copier for Pictures, Negatives & Slides Features: Digital Copier Converter: Digitizes Photos, Slides & Films HD Hi-Resolution Image Scanner Scans 35mm Film, 135mm Film, Slides & Negatives Scannable Photo Sizes: 3.5 x 5 , 4 x 6 and 5 x 7 Simple & Hassle-Free Operation Standalone System: No Computer Required Save Your Files Directly via SD Memory Card Slot Includes Software CD for File Management Preview Your Pictures & Media Before Scanning 2.4 -inch Digital Color LCD Display Front Panel Button Control Center Compact & Portable Tabletop Design Automatic Image Adjustment Processing Adjustment Easily Save, Share & Transfer Files via Your Computer Rediscover & Convert Your Long-Lost Photos, Slides & Film Negatives! 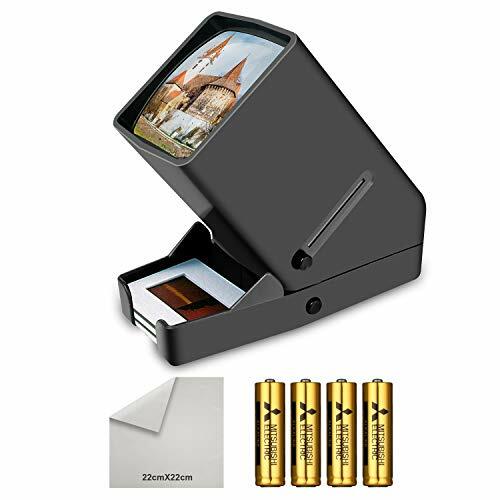 What s in the Box: 3-in-1 Scanner Slide Holder Film Holder Photo Holders Software CD USB Connection Cable USB Power Adapter Technical Specs: Image Processor: 5.1 MP Megapixel CMOS Lens Specification: 2G3P F/NO=3.97 f=4.04 Film Range: F/NO=4 f=3.93 Photo Range: 170mm Digital Filetype Created: .JPG USB Interface: 2.0 Data Conversion: 12 Bits per Color Channel Scan Method: 1800 DPI or 3600 DPI Interpolation Scan Processor: 10M interpolation USB Power: 5V Adapter Dimensions: 8.6 x 8.2 x 5.8 -inches The Pyle 3-in-1 Photo, Slide and Film Scanner creates convenient digital image files. Save and share your favorite memories with friends and family when you convert and digitize your media. Once you scan, the digital copier saves your files via the SD memory card slot -- so you can easily manage and transfer your media to your computer. Automatic image adjustment and processing provides hassle-free operation for hi-res HD images. The built-in LCD display screen allows you to preview the image before converting to a digital file. 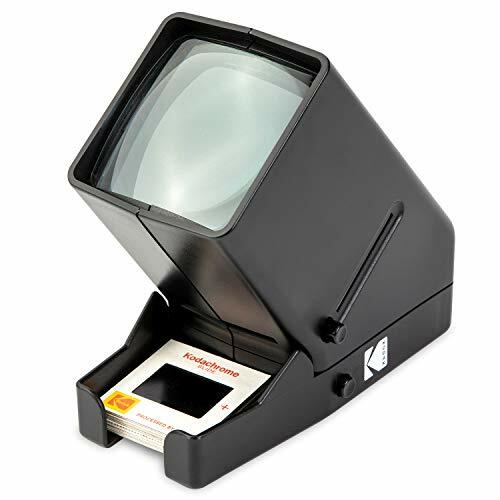 The scanner digitizer system is also compatible with various different size photographs, film negatives and picture slides (compatible with photo sizes: 3.5 x 5 in, 4 x 6 in, 5 x 7 in, 35mm & 135mm slides / films. Rediscover past memories and share the experience with the Pyle Picture, Slide & Film Digital Converter System. EASY FILE TRANSFER: Photos can be saved into any SD memory card. Simply plug the USB connection cable into any USB port on your PC or mac and put the scanner in USB transfer mode to transfer the digitized photos. It also has a USB power adapter. 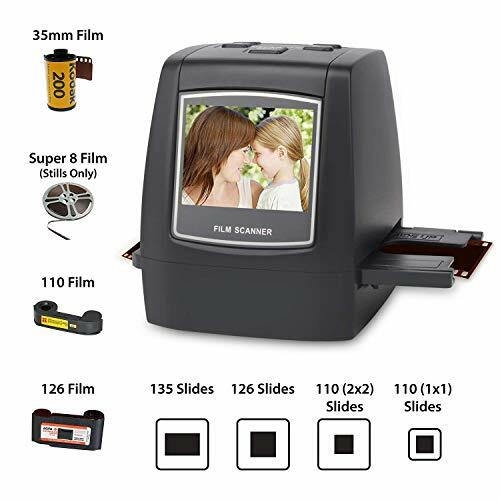 DIGITAL LCD DISPLAY: View your scanned slides and films with the vibrant full color, 2.4 inch LCD screen with 5.1 megapixel super high resolution. It is a standalone system that doesn't need a computer to convert your slides from outdated to updated. VERSATILE PHOTO COMPATIBILITY: Save time and effort with the fast-loading film holder. Scannable photo sizes 3.5 x 5, 4 x 6, 5 x 7 lets you get through of film, negatives, and slides in no time. It has front panel button control for easy use. 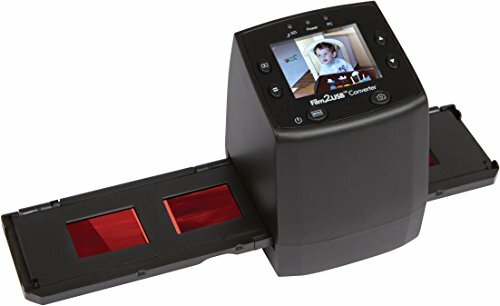 Plustek OpticFilm 8200i SE , 35mm Film & Slide Scanner. 7200 dpi / 48-bit Output. Integrated Infrared Dust/Scratch Removal. 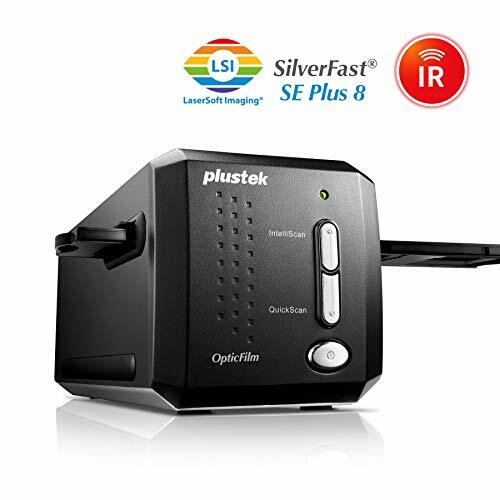 Bundle Silverfast SE Plus 8.8 , Support Mac and PC. will display your digitized image. Descriptions: Make extraordinary enlargements from film. It's user friendly and super professional. 2.4inch LCD display screen and it is in high performance. 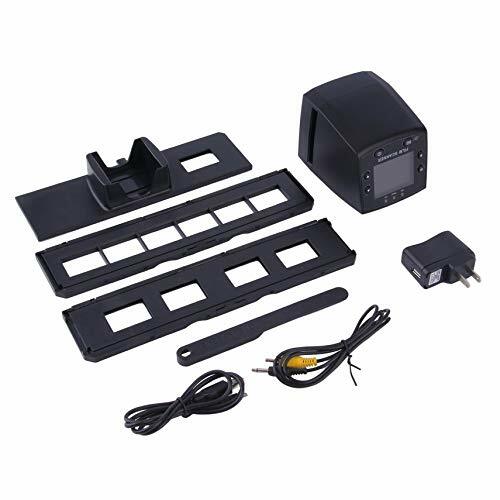 Specifications: Function: Film Scan / USB MSDC Interface: USB 2.0 Image Sensor: 5.0 Mega pixels (2592 x 1944) Display: Color 2.4 TFT LCD (480 x 234) Focus Range: Fixed focus Exposure Control: Automatic / Manual (-2.0 EV~+2.0EV) White Balance: Automatic Resolution:: 5.0 Mega pixels 10 Mega pixels (interpolation) Scan Quality: 1800dpi & 3600dpi(interpolation) Picture Effects: B& W, slides, negatives Light Source:: LED Backlight File format: Picture: JPEG External memory: up to 32GB Power Supply:: DC 5V (Adapter USB Port) Multi-languages Support: Yes Size: 11*8.5*8.2cm TV-OUT type: NTSC / PAL Film type: 35mm film, monochrome, slide Package included: 1 x Digital Scanner 1 x USB Cable 1 x Video cable 1 x Negatives (Film) Holder 1 x Positives (Slide) Holder 1 x Rapid slide feeder 1 x Power Adapter Notes: Please allow 0-2mm error due to manual measurement, thanks for understanding. Due to the difference between different monitors, the picture may not reflect the actual color of the item. Please understand, thank you! It is the perfect device to help you easily organize and externalize them. At the touch of a button, the image digitizer will scan and convert your old memories into vibrant digital images in JPEG format. It can be viewed on your computer or other device, or printed out as regular photos.